Marinate the fish with salt, black pepper and garlic salt. 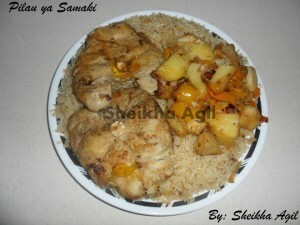 In a karai, add some oil and fry the potatoes until almost tender, then remove the potatoes and put them aside. In a non-stick frying pan, add some oil and cook the fish until the fish is cooked, then remove the fish and keep aside, in the same frying pan, fry the sliced onion until golden then remove and keep aside, then add the yellow bell pepper and cook for about a minute then add the cooked onions and potatoes and stir. Next add some garlic salt, ground black pepper, red chili flakes and some salt, then keep aside. In a pot, add the oil and fry the onions.Then add the ginger/garlic paste, followed by the spices and salt. Then add the rice and some hot water and cook until the rice is almost cooked, drain any excess water from the rice, you want the rice flaky not mushy. Arrange the rice nicely in a pot, then add half of the cooked potatoes with bell pepper, next add the fish and finally add the remaining potatoes and bell pepper, then bake in a 350 degrees oven until the rice is well cooked. 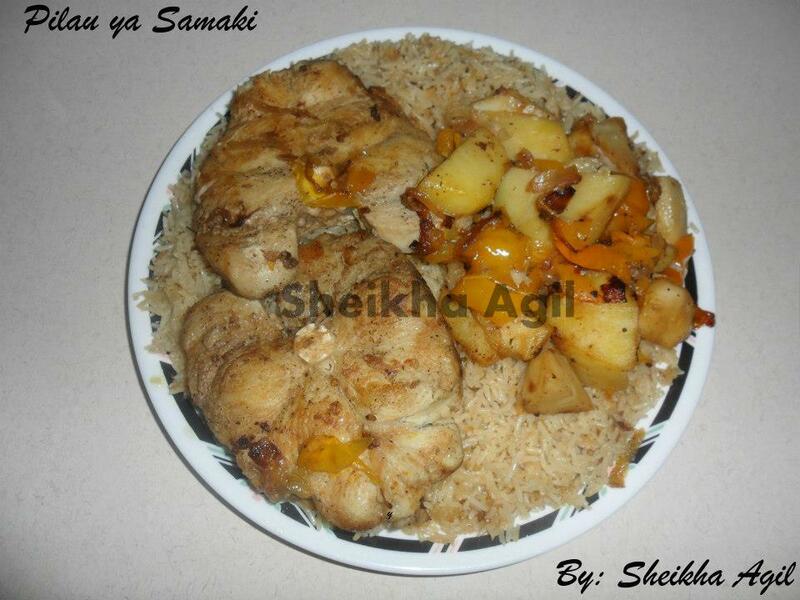 To serve, remove the cooked rice from the oven, don’t forget to turn off the oven, then remove the layers of potatoes and keep it aside, then remove the fish and keep aside, then remove the other layer of potatoes and keep aside, then place the rice in a serving dish and place the potatoes on one side of the rice and the fish on another side.